This package is abandoned and no longer maintained. The author suggests using the artfocus/jetorm package instead. THIS IS NOT OFFICIAL YetORM LIBRARY. IT'S A MODIFIED FORK. # setup this only on production otherwise Entity doesn't load new Refletion until cache will be deleted! 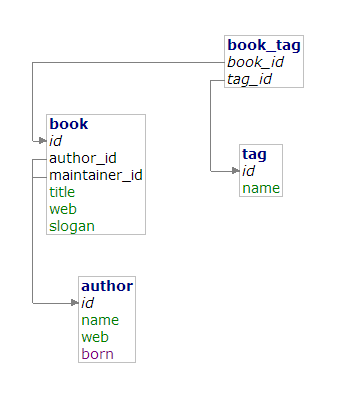 There are some relations at the Book entity - two N:1 Author and M:N Tag relations. Every YetORM\Entity has an instance of YetORM\Row in it, which is a simple wrapper around Nette\Database\Table\ActiveRow. That means that we can access related rows or column values through it. With $row->ref($table, $column) we're accessing related table row in table $table through column $column - pretty simple. Every repository has to have table and entity class name defined - either via @table and @entity annotation, or via protected $table and $entity class property. To persist changes we make simply call $repository->persist($entity).